With a high risk in place over western MO and eastern KS, I decided to do some chasing en route back from Waterloo, Iowa, where I had been visiting my father, to Edwardsville, IL. This would require a substantial westward detour; the question was how much west. The models had consistently shown a narrow axis of very good instability along the KS-MO border; along a warm front moving into very rain-cooled air across MO. A big question was how far north and east the warm front would get; not far behind it would be a dry line advancing across western KS. Shear was awesome everywhere so that would not be a problem, exactly where the storms would fire would be, however. In the morning, the warm front extended from NE KS and far E NB toward the SSE into extreme SW MO. A low near the KS-NB border would push the front and dryline eastward, but a big question was how far north it would push the warm front, and how fast that front would advance east into cool air. As it turned out, not as far as many forecasts were indicating. Based on morning analysis, I was initially going to target the area around Milan, MO. I debated heading diagonally to the DSM area then down I-35, which would get me to Trenton, MO, a little farther W toward the better instability. But when I examined the RUC around 9:00 a.m, it showed precip breaking out in the area between about Milan and Kirksville, and nothing through 0Z in the western area of better insbability. Based on this I decided I need an east option should the storms all develop in north-central MO - I hate playing catch-up - so decided initially to aim for the area between Kirksville and Milan. Had I taken the western route, I would have been in better position. I left ALO at 12:40 p.m. with the temperature in the upper 40s, steady rain with occasional thunder and lightning, and a howling ESE wind of around 30 mph with gusts approaching 40. As I headed south on U.S. 63, this was basically the weather until I got well S of I-80. At 1:30, I heard my first warning of the day, a flash flood warning for the DSM area, where up to 2 inches of rain had fallen on top of previous heavy rains. By 2:10, when I crossed I-80 and stopped for gas, the wind was even more intense, and the rain still coming down - temp no warmer than 50. Basically I remained in wind, gunge, and occasional light rain all the way along my route, which began to jog SW around Oskaloosa, IA, to pick up route 5 to Milan, MO. While I was in Oskaloosa, I had hoped to use the library to get data, but found it closed on Sunday. So I called Chris Novy, who was chasing in western MO and had mobile access to data. He advised me that the warm front was laying back farther west than expected, and alligned more NNW-SSE than NW-SE. This meant I would need to get as far west and south as I could - certainly more so than I had planned on. Thanks for the assistance, Chris! Given this, I blasted south on 5 to Milan then west toward Trenton. I was beginning to hear reports of tornadoes in the Kansas City area and of a strong storm SW of Warrensburg, MO. By the time I got to Trenton I had been hearing reports of a large, destructive, long-track tornado in the KC area, and determined that I could cross ahead of the storm heading south on U.S. 65 from Trenton through Chillicothe, and perhaps intercept it west of Carrolton. As I headed toward Carrolton, I continued to hear reports of the storm in Ray Co., still reported as having a "large, destructive tornado." I got to Carrolton around 6 and blasted west on route 10 toward Richmond, where the tornado was reported to be, moving east. Soon a TOR warning was issued for Carrol Co., with the tornado expected to reach Norbonne by 6:25. Like all day, I remained in low-visibility gunge, and I had also been in anvil rain since about Trenton. I arrived at Norbonne at 6:15, found a good viewing spot just south of town where I could easily return east if I had to, and waited for the show to arrive in 10 minutes. 6:25 came and went with no show. Finally around 6:30 I could see ragged, scuddy RFB to the northwest, and heard an updated report indicating the area of rotation passing about 5 or 6 miles to the north - farther than you could easily see in the rain and gunge. I headed through Norbonne and tried to go north, but got stopped for 5 minutes by a train. By the time I finally got to the top of a hill where I could see something, I could see the meso, looking very rain-wrapped and occluded, perhaps 5 miles NE. I was right under the flanking line/gust front SW of the storm, and could see some violent motion in the clouds, but no lowering and it looked very outflowish in my area. At that time, thet WX radio announced that the TOR warning was cancelled because the storm had weakened. Although the storm had been reported as having a "large, destructive tornado" 15 or 20 minutes earlier, it basically croaked as it moved over the cooler, more stable air NE of the warm front. In fact, it had been quite a bit longer than that since the storm had actually had a tornado; in fact the tornado did not even make it to Ray Co., much less Richmond. A copy of the NWS-EAX damage survey for this storm can be found here. As I tried to work SE to the next storm, I was listening to a blow-by-blow account of the storms from KMMO radio in Marshall, MO, 1300 AM - an excellent info source if you are chasing in thie area They described what sounded like a left split from the next supercell south, now near Warrenton, as it moved rapidly NE toward Marshall. I blasted down U.S. 65 toward Marshall, and skirted the SW edge of the storm, catching some heavy rain and gusty SE winds just west of Marshall, as the storm reportedly dropped pea-size hail in Marshall, but I encountered no hail at this location. I was trying to work SE to intercept the supercell coming out of Johnson Co. into Pettis Co., which had produced reports of tornadoes near Warrensburg, and remained TOR-warned. When I got to Marshall Junction, where I-70 and U.S. 65 intersect, it was clear the storm had beaten me to U.S. 65, and if I went any farther south I would get pummeled. 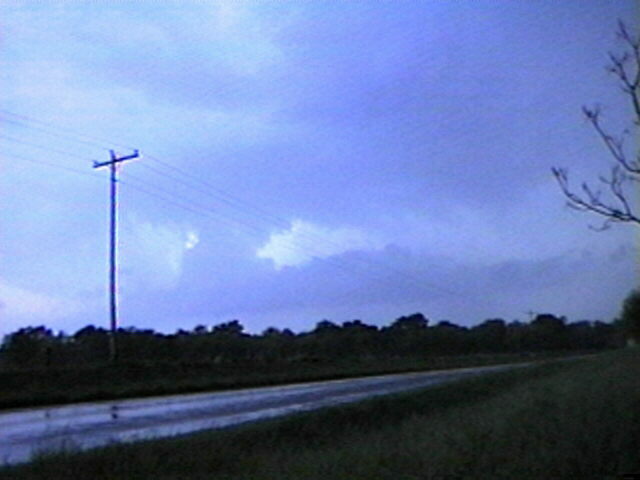 So I stopped there a little after 7:30 to perhaps 7:45 and took pics and video, catching the storm's updraft minutes after it produced its final tornado a few miles SW of me at 7:35. Darn trees! Maybe I could have seen something under there if they had not blocked my view! Now the storm began to rapidly weaken and shear apart, and I could see a second storm, which now was SVR-warned, coming behind it along more or less the same path, out of Johnson Co. and into Pettis Co. So I blasted a few miles south on 65, turning west on route D past a police car and a few chasers, and went maybe 3 or 4 miles. This storm, the best of the day for me, had a lot of in-cloud lighting, and displayed a narrow updraft and beavertail to my SW. Finally, some interesting storm structure that I could actually see! 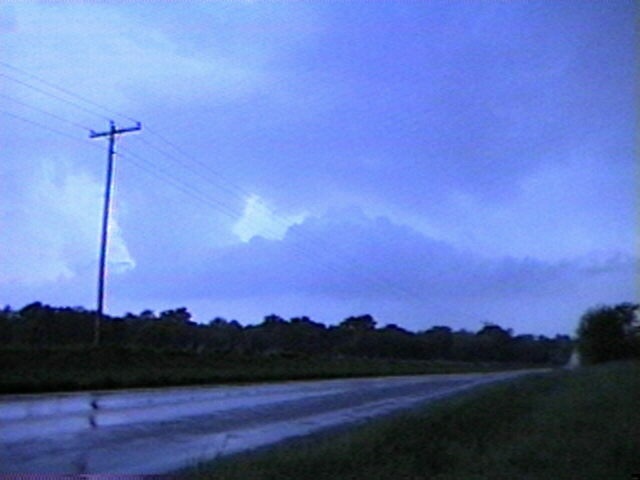 The rain and hail core was on the right side of this video capture, and farther to the right off the picture was a sort of a shelf-cloud feature. 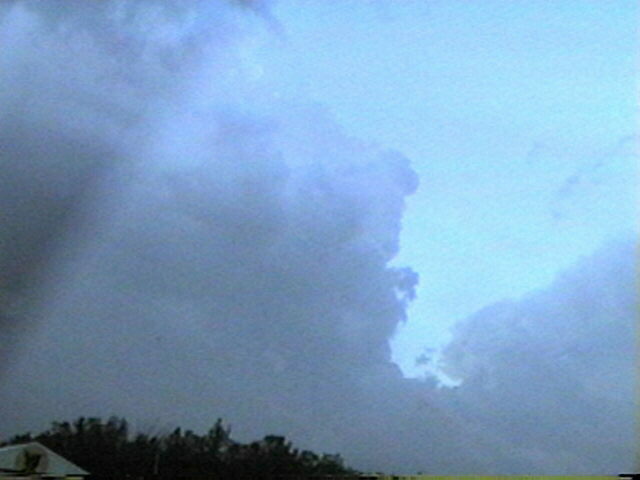 As shown in this video capture - an updraft rapidly formed in the beavertail structure, which soon merged with the parent cloud above it and became the main updraft. An intense rain and hail shaft formed just behind it, as seen here minutes before I bailed east to avoid the hail. Around this time, dime-sized hail was reported in Houstonia, just to my NW. I stopped again a mile or so east to watch the storm as the meso passed less than a mile to my north, and that proved to be a little too close, as the storm tossed out some dime sized hail to my location. Fortuantely, it wasn't much, and once the storm passed, that was about it, as it was really accellerating off to the NE. I called it a chase and headed north, got gas, and got on I-70. I had the storm in front of me all the way to Columbia before I caught up to it again, but it steadily weakened and pretty much died by the time it and I reached COU. The rest of the trip home was an awesome show of in-cloud lightning and some spectacular anvil-crawlers, both from the supercells to my south that produced killer tornadoes in the Ozarks, and from a fast-moving squall line that had developed west of STL. Arrived home around 11:30 in light rain on the back side of the squall line; total distance for the day was 550 miles, rougly 180 more than if I had taken the direct route home. So we'll call it 180 chase miles. 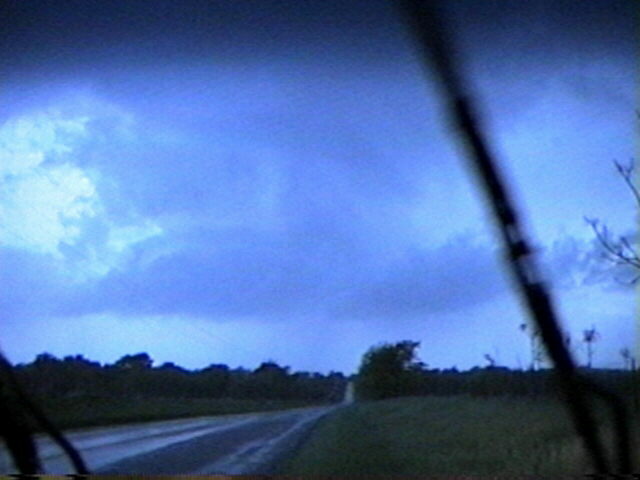 I came really close, expecially at Marshall Junction, but saw no tornadoes on this outbreak day. Had I taken the Des Moines route, I might have. Had I left earlier, I would have had a great chance, but this was not primarily a chase trip, but a trip to visit my ailing 90-year old father. I left when I normally would have on a weekend trip there, and I would not change that, even to see a tornado. There will be other storms. Besides a late start, another thing that made this chase difficult was the crappy visibility, partly due to the hilly terrain but mostly due to the low clouds in the cool, moist air - I never saw any storm structure until I was within 5 miles of the first storm. After that it was better, but by then I was playing catch-up and simply could not get on the first Johnson-Pettis County storm fast enough. A damage survey from NWS-EAX for the first Johnson-Pettis storm can be found here, and a map showing the tornado tracks and times, with my positions and times shown in blue print, can be found here. A listing of local storm reports from the Kansas City (EAX) NWS office is also available. Finally, here are a couple radar images. The radar at 6 p.m. shows the first storm I was on about 2/3 of the way up in the middle of the picture - located in northern Ray Co., and tracking a little farther north than indicated by the warnings and statements. The 8:00 p.m. radar shows the second Pettis Co. storm (just NW of SZL) about the time I was on it - notice how much the first storm, to its NE, has now weakened. Notice also the intense storms in SW MO, some of which produced killer tornadoes. This was a very bad day for many people in Missouri who were unfortunate enough to be in the path of the multiple strong tornadoes that moved through the state, as well as neighboring Kansas. 1. The faster route may be better, even if it doesn't take you quite as close to your initial target. The narrow, winding roads of southern IA and northern MO slowed me down a LOT, and I could have gotten where I needed to be much quicker by going to DSM and taking I-35 - even if I had needed to backtrack east to my original target (which turned out not to be the case). 2. You can't always rely on the reported movement of the storms on the SVR warnings and statements. The KC storm was tracking a good five miles north of what the statements indicated, which makes a big difference when your view is blocked by gunge and haze. 3. Missouri roads are a hassle, and even the small towns have multiple stop lights that all seem to change at the exact same second, guaranteeing you'll end up waiting for several. 4. Don't take the RUC precipitation forecast as gospel. Storms broke out where RUC showed NO precip.